Our fifth birthday when many memories were made! approach to planning (relevant, engaging, authentic learning) produced some fabulous learning such as a video produced by Y5/6, Talk for Writing themes shared by Reception, Y1 and Y6 and singing from Y2, Y3 and Y4. We loved watching the firework finale – a perfect end to a lovely day. Thank you so much to everyone for coming. Last week our early years team welcomed a special group of visitors from Hartford Court Care Home on Friday. They joined us for lunch and were delighted to see Santa too. They were especially pleased with Chef Lynn’s mince dinner and loved seeing the records of the children’s visits to them as well as the photos. James enjoyed painting and remembered winning art prizes when he was at school and we were delighted to learn that Shirley used to be a pig farmer herself – if only we’d known earlier! Check out the ‘School’s Out’ section of the Evening Chronicle from Thursday this week. Y4 have reported on our celebration events and about what makes our school special. They have done a fantastic job – well done Y4! The school nursing team are visiting next Wednesday 6th December to provide nasal flu vaccinations for children from reception to Y4. Please ensure that you have returned consent forms for this service by Tuesday 5th December. navigate the many dangers that our children face online. No need to book – just come along on the day. Please check ‘dates for your diary’ section below for children’s Christmas party/disco plans! Congratulations to Y5 again who win extra playtime. Santa was even able to spread a bit of Christmas joy to the residents as they visited the yurt’s Winter Wonderland as part of their visit. We were delighted that they wanted to buy some of our commemorative books too. Thursday’s Chronicle. We still have a few copies of the commemorative book if parents would like to buy extra copies for family and friends. £4 per copy available from the school office. Clubs in the last week. 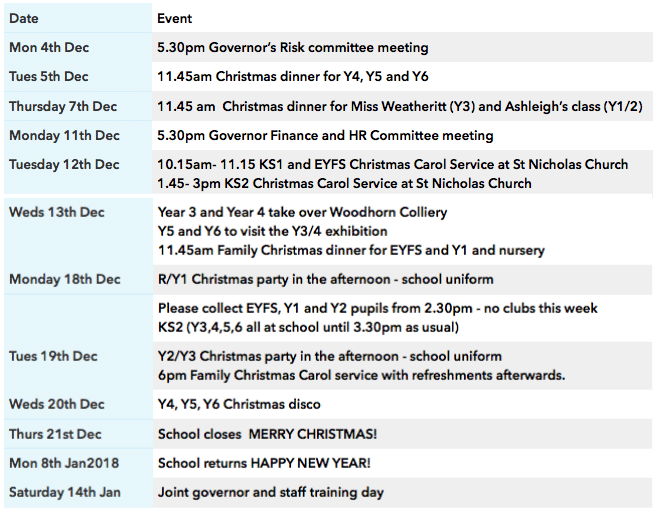 Please note that from Monday the 18th December there will be no clubs for EYFS and KS1 that week. Please collect the children from 2.30pm that week. KS2 will stay at school as usual until 3.30pm.